Last month I met a colonel that I once worked with in 1988, when I was a first lieutenant and he was a major. It was less than two weeks, but the experience was so vivid that I recognized him immediately. Now, like then, I am impressed with his quick intelligence, his apparently excellent education, and his strength of presence. We were at a reception following a change of command and he walked up to me and introduced himself. After 11 years of being a civilian, I am a mere major but he still walked up to me to start a nice conversation. I recognized him instantly, he didn't place me of course. After explaining how we once met before and where it was, he jocularly said, "Oh, you must tell stories of what a horror I was as a leader." Without batting an eye, I said, "Of course." I didn't tell him though, that I'd been telling a story about him for 15 years as how to be a poor leader. Let me be more clear. I actually admire the man, and I think he is an excellent leader overall. But the two weeks I spent with him have served me as an enduring example of exactly how not to be a leader. Everyone makes mistakes, even the best leaders, and here is a time where he screwed up, may have never realized he screwed up, and his failure caused lots of problems and could have caused a very big problem in a shooting war. So, I think the story is worth telling again. With all due respect to the colonel should he see this and recognize his role in the tale, I think it's important to learn from mistakes, just as it is important to learn from his other good traits. The colonel appears now, and was definitely then, a very energetic, firm, demanding, and generally fair officer. I would happily serve with, under or near him any day. I honestly like him. Here's the set up. The exercise was named Freedom Banner, but many of us called it Freedom Banana. It was among the early Maritime Pre-positioning Ship offload exercises and FB88 was the first time that an entire ship's load was to be completely disgorged to the shore, including aviation assets. Upon arriving at the beach, the equipment was further disbursed to various groups that needed the equipment. Since all units needed much of the same equipment, the logistics challenge was to sort it all out to make sure that each group got its full complement without overtaxing them with all their gear at one time. It's a lot harder than it sounds. My job was to be the Air Combat Element Liaison officer, working in the watch that controlled the offload operations. The major was the watch officer. He was responsible for deciding where all the equipment went after it landed on the beach. He had a small staff, and several liaison officers such as myself, I was with the ACE, there was also the Ground Combat Element, the Service Support Element and various other people. As a liaison officer, I didn't work for the major, I worked for the ACE. My job was to represent the ACE to the watch officer, our subject major. The best advice I got when leaving for this operation was to remember that the ACE is always right. Even if it looked like we weren't right at first glance, events would always bear out that we had everything right, the other groups were much more likely to be wrong. This advice proved very accurate. There were two watch officers, and as I recall there was a short overlap so that I worked with both each day, but the majority of the time I advised our major. I talked with the Marines in the ACE on what they were doing and what they had and what they needed and kept the major up-to-date on our status. But every time the major came on duty, everything started going wrong. The previous watch everything went smoothly but after the day watch came on, confusion and out right chaos began to result. Everything was getting bogged down in the Beach Operations Group, or the BOG. Our major didn't cause this problem, it just always happened at the same time he arrived. His response, in contrast to his otherwise intelligent and inspiring behavior, was to yell. He yelled a lot. It was the first time I had seen this kind of behavior since I left The Basic School, and I wasn't impressed. I never really understood this behavior and it certainly didn't help. In fact things just got worse and worse and worse and no one knew why. I didn't work for him, and yelling isn't painful, so I wasn't bothered at all. But many of the other people there reacted to his yelling by yelling at their people too. Anger grew, resentment built, confusion reigned and nothing got better. In fact it kept getting worse. I don't remember exactly how it was finally resolved, but I distinctly remember what the problem was. I think the cause was finally discovered by the other watch officer getting out during our watch and walking many miles and talking to a lot of people. Here's what really happened. In the BOG, there was a team of about 4 to 6 people who had desks and lists and a radio. We radioed instructions to this group and they told the drivers where to deliver the trucks, trailers, tanks, etc. It was all very well planned. The radio operator was supposed to receive our transmission, write it down and deliver it to the rest of the team who carried out the instructions. But instead, everyone but the radio operator was goofing off and the poor Marine with a heavy radio on his back had to run around, receive our instructions, and tell everyone what to do. It was all too much for one person. He couldn't possibly do it all, so he ended up completely ignoring all our instructions and just made up his own instructions. So the landing craft would offload a HMMWV towing a water buffalo, a Dragon Wagon fifth wheel towing a fuel tank, and a TOW missile launcher towed by another HMMWV, and we'd send them to the ACE, the SSE, and the GCE respectively. But the BOG would send them all to the GCE or whatever he felt in the mood for. In the AAOG (I think that's the acronym for where I was, Assembly Area Operations Group) we would wait for word that the equipment arrived as expected and nothing would be right. So this is getting long. The point is that the problem had a distinct cause. Yelling at people in an attempt to motivate them does no good if the underlying problem is ignored or unrecognized. In complex systems, intelligence is needed to make things work. There is a time and place for yelling. There is a reason to provide extra motivation. But in this instance the major failed to understand what he was trying to fix. Rather than investigate and correct problems, he treated us like we weren't already disciplined and enthusiastic participants in this exercise. Once we found this problem, after a week of agony, we straightened out the BOG and things went much smoother. But the resentment at our treatment by the major lingered and what should have been an excellent training exercise was nothing but misery for those who bothered to take the major's reactions seriously. As for me, I wasn't bothered directly because I didn't work for him. But I never forgot this story. I can't say that I've never made leadership mistakes, but I hope I never made this one after seeing this. A democratic republic is the best form of government yet found by mankind. Its freedom promotes capitalism and prosperity and makes for great wealth and power. But a democratic republic such as ours, as well as any democratically-based society, has a vulnerability that can allow us to be destroyed if we're not careful. What is the weakness of a democracy? It is simply that we are free to be disunited, inconsistent, and destroy ourselves. A clever enemy would take advantage of that tendency and work to destroy us. What are some examples? Again, I will go back to my favorite topic, Athens. Athens throughout the Peloponnesian War continued to amaze everyone with its enduring power in the face of adversity and even tremendous setbacks. They endured years of plague that wiped out perhaps a quarter of their population, they endured constant destruction of their lands by marauding enemies, but they were unconquerable. Time after time, they managed to overcome the odds and claim victory after victory over their enemy. Athens lasted a few decades longer than anyone expected them to last. Even after losing almost their entire army and navy in the Sicilian campaign, they reformed and held off the Spartans again and again. But after a few poor decisions by a general or two, they lost command of the sea and unfettered access to the Black Sea, their source of food and wealth. And their people began to be desperate. With their desperation they struggled to find a way to win, but that desperation also created a climate for power seekers to take advantage of the situation. Making wild promises of bringing in the Persian Empire as an ally, a cabal got the people to vote in emergency measures that were exploited to destroy the democracy and institute an oligarchy, and through a reign of terror, and dictatorship of a few elites. It was fear and desperation that caused the demos, the people, to fail to unite behind a winning plan and to become vulnerable to traitors. Fear made them lose intelligence and reason, and the demos became a mob that was manipulated. So how does this apply to us? Terrorists cannot defeat us militarily or economically. They can't directly defeat us at all. But if they manage to scare us, it is possible that we might become disunited enough to descend into a self-made chaos. We're starting to see some hints of this. Men like Howard Dean are incredibly popular still. Dean's calls for an end to our campaign against terrorism and Iraq stirred up a pacifist element, and the socialists who failed to create the chaos needed to disunite us during the cold war may finally succeed in overthrowing us. The Athenians were convinced to repatriate the traitor Alcibiades with the promise that he would bring Persian aid with him, but ended up voting in a power mad cabal to overthrow the democracy. Likewise, we may, after the socialists failed to overthrow us in the cold war, finally be vulnerable to their treachery. If the terrorists are clever, and we have every reason to think that they are, they will exploit this rift in our politics to their advantage. This is the weakness of a democracy. We can be misled by demogogues and rabble rousers. We can succumb to fear and lose the unity of principles that makes us so strong. The demogogues are being very effective now. We have a leader who is doing most of the right things in this war, but he has so far been unable to overcome the demogogues. We need a leader who can unite us and keep us committed to the war effort. Our current leader has been waging the war well, but he hasn't been very effective yet in uniting the people behind his actions. Let's hope he can learn to articulate the danger to us in a way that will restore our unity. Because our unity is our only defense against this vulnerability of democracies. I am in Virginia now and I went to visit my brother in Arlington. Of course, I got lost and somehow found myself in DC, on Pennsylvania Avenue. In my wanderings to get back to where I wanted to go I passed several monuments. I was shocked to see an ugly wall erected around the Washington Monument. I know that it is only prudent to protect this and other monuments in this time of terrorism, but it really bothers me that these subhuman Muslims are forcing us to live this way. We just haven't killed enough of them yet. The recent erection of walls around Palestine and the subsequent calls to demolish it, this time from some self-important "world court" calls to my mind the bizarre history of walled cities. I hope this is short. In ancient days, around 400 to 500BCE, most cities were not walled. Only large and powerful cities had walls. It was considered provocative to build walls around your city, as if to say that the city wished to be immune from international law. A part of many treaties was the demand that no walls be built, or that walls be torn down. When Athens built the "Long Walls" to their port of Piraeus, Sparta was outraged. The entire Peloponnesian War is filled with stories about people building walls and shocking their neighbors. Back then walls were almost impregnable. Seige technology did not exist to overcome this defense. Later, as seige technology improved, mostly by the Romans who were masters at it, more and more cities began to build walls and fortifications. It seems that the objection to walls ended only when the dominant militaries learned how to destroy them. But before that time, any plans to build walls were met with outrage. In the Roman Empire, during the Pax Romana, walls again fell out of favor simply because cities were safe. Then they came back in fashion in the Dark Ages. Only recently, say the past 250 years or so, have walls again fallen out of favor. But look what's happening again. As warfare retreats into terrible, murderous, low tech terrorism, walls are again showing their utility. Israel is building walls to protect themselves from bombers. In Iraq, the US used crude walls to isolate cities, and used walls around their own buildings and camps for protection. It's funny that now that walls are useful again, that people again regard them as an offensive action. The analogy can be extended to missile defenses but I'm running out of time. Maybe more later. I toured the Getty Museum in Los Angeles today and was struck by how it seemed to reflect the impressions I've always had of the Acropolis in Athens. I've never been to Athens, but I've read many descriptions, mostly Pausanias and others discussing Pausanias. I can't help but think that this is what the designers intended. Both are located on the top of a hill, with white stone buildings and lots of open space. But the differences are just as stark and I think they are more than just arbitrary. They reflect the philosophical culture of our times and contrast that of the Greeks. The Greeks, at least those that made the Parthenon and much of the Acropolis that it is located on, understood that man is capable of rational thought and that thinking is what separates men from animals and allows them to create civilization. In fact they understood that civilization is possible only with rational thinking. They saw themselves, rightly, as being able to master their environment. Their architecture reflects this mindset. 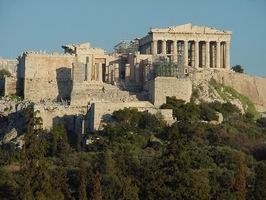 The buildings on the Acropolis are made of stone hewn from the earth and shaped to their desire. They either made statues or walls and pavement. In the walls of the buildings and monuments, the stones are tightly fitted and smoothed. They prided themselves on creating columns that are made of stone so well joined that the joints are virtually invisible. Only more than 2000 years' worth of earthquakes have made some of the joints vaguely discernible. This is because the Greeks knew that they were better than whimsical nature. They were men and they could think and plan. Entropy is the scientific idea that everything inevitably trends towards less organization, becoming less organized and more chaotic. The Greeks possessed intelligence which is the opposite of entropy. They knew that it was man who created order in the universe and their art celebrated and reflected this understanding. Contrast that with today. Today, like the past 150 years, intellectuals have been driving our philosophic culture in the opposite direction of the Greeks. Man is impotent and incapable of understanding nature, let alone improving upon it. This backwards ideology is reflected in the architecture and often through the choice of art. The most striking difference is in the stones used for the building walls. Unlike the Greeks who used highly polished, fitted stones, the Getty Museum uses stones with a purposefully rough surface. Actually, "rough" doesn't quite convey the right image. These stones are purposefully cut to be as irregular in their outside face as possible while still maintaining a rectangular cross section. So the designer at once wanted to convey an image of regularity as though it were imposed by the necessity of the building, yet at the same time project a texture to the wall, presumably to make it appear more natural. The effect is even more jarring because the irregular faces of the blocks don't meet at their edges so that if you are near the wall you are accosted by parts of the smooth sides of the blocks standing out at the joints. Even worse, there is no mortar and the blocks are spaced about a quarter inch apart. It's an altogether unpleasing effect. There's nothing grotesque about the stones and how they're used, it's just that the effect isn't very good. It looks half-made, like they couldn't be bothered to make something that looked nice. The texture effect isn't bad, and there's something to be said for the texture versus a highly reflective smooth finish, but the execution fails. I'm sure it took great skill to make these stones look so badly assembled, it's such a pity that the skill was purposefully masked. 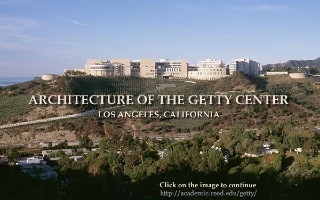 And so the Getty Museum's architecture is a fitting presentation of the mind set of modern art. Modern artists may, perhaps, almost be skilled, but they work hard to prove that they aren't. People who talk about international relations often mention dire consequences if a power vacuum occurs. But sometimes the vacuum is only apparent in hindsight and not immediately. I think we are currently floundering in a power vacuum and if we or someone else doesn't fill that void quickly enough, not only can it be dangerous for us and our neighbors, it could be the end of civilization and culture as we know it. Let's look at some prominent power vacuums and the disasters that befell subsequent to the void's creation and failure to be filled. The first one I'm most familiar with is the failure of the Greeks to exploit their victory over the Persian hegemony. The greatest military power in Greece was Sparta, by far. They dominated not only in reality, but all the other Greek cities recognized them as the leaders. Athens had a superb navy, but generally at the end of the war with the Great King of Persia the Athenians didn't understand the immense power of their fleet. Persian hegemony was checked when Xerxes was defeated in his attempt to invade the Greek mainland, leaving a power void. Rather than unite and allow their superior culture to propel the world into economic and scientific prosperity, the Greeks descended into decades of wars with each other. The war has been analyzed in great depth by the greatest scholars of each generation since then, with lessons learned on how the war could have been won by one side or another were it not for mistakes in its execution, but most analysis of the war ignores that Sparta, with its strong tendency towards isolationism, failed to exploit the victory over Persia by retaining its place as leader of the Greeks. Even the Athenians expected Spartan leadership in the beginning, but Sparta's fear of outside entanglements that would keep them from enforcing the subjugation of their own populations prevented them from establishing a united Greek state. So, in the absence of Spartan leadership, Athens established its own Delian League meant to protect itself and its mostly island Asian allies from a return of the Persians. And thus began all the trouble. The result of the wars between Sparta and Athens is that Persia was able to play one side off against the other. Persia's power was dying, about to be overrun by Alexander the Great, but in its dying spasms it destroyed all hope of Greek military dominance. Instead, Macedonia led by Alexander created a new, expanded empire that included Persia, Egypt, Greece, and what are now known as Afghanistan and Pakistan. During the death throes of the western Roman Empire, there was no power to fill the vacuum. In fact, the power that could fill the vacuum was the dissolving Roman Empire. Having no strong neighbors left Europe without anyone in charge. The power vacuum in the West was filled by the Roman Catholic church. A few hundred years later the eastern Roman Empire faced a similar fate, but their vacuum was filled by the Muslims and later the Turks. It took more than a thousand years before Europe rose above its dark ages, spurred on by the end of the monopoly on mystical power through Martin Luther's revolutionary Protestantism. It's true that much of the continent was united from time to time, most notably by Charlemagne, but this power and unity always proved temporary. It wasn't really until the Arabs were thrown out of Grenada, Spain in 1492 that Europe began to assert itself militarily and eventually come to dominate the world as an amalgamated culture. With the end of the cold war the United States has successfully, so far, taken the leadership of the Soviet Bloc nations and stabilized Europe and most of the world. But one of the effects of the end of that struggle is that the former Eastern Roman Empire is now unfettered and challenging the US role in filling the Soviet's power vacuum. It is critical to civilization that this power vacuum be filled and this challenge to world peace and order be put down. It is the responsibility of the United States to restore civilization to the world. We cannot choose to back down because that will leave a power vacuum that will be filled by the type of people that think it a lovely day to cut peoples' heads off. If we don't rise to this challenge, there's no telling what might happen, but history has shown that it's rarely a good thing when a power vacuum isn't filled.